Come back, GT Dave! | Ooh, my favorite! GT Dave’s Mango Kombucha, and my traffic cone orange nails. Hi, my name is Natira and I am a ‘buchaholic. It started casually enough; I’d have a sip here and there if it was around, but before I knew it I was sneaking off to buy a bottle for myself. Then pretty soon that wasn’t enough – I wanted one before lunch, then again pre work-out…but then there was also the post work-out craving. It’s euphoric: the thirst quenching effervescence, the gorgeous array of fruit flavors, the wonderfully clean feeling. Suddenly I was in need of a separate budget item just for this little elixir. I needed help and I knew it. Now I’m down to a bottle a day, but I’ll always want just one more sip…. Recently GT Dave has voluntarily recalled his Kombucha to re-evaluate the alcohol levels that are on the label. Since the drink is fermented it has slight levels (currently labeled at .5%), but that level may be higher since it may continue to ferment during shipping. I’m DYING! I can’t find it anywhere. I haven’t had a soda in years, I can’t take all the sugar corn syrup, but I crave carbonation. More alcohol or not, Kombucha is an amazing drink to health and balance and I can’t do without it and its natural fizziness. I’ve tried four, count ’em f-o-u-r different Kombucha brands this past week and they are all a joke. Excuse me, but why would you pasteurize your Kombucha? Oh yeah, and why would you add sweetener? No. Nice try, but that’s not what Komucha is and that is not a drink to health. Puh-leeeze hurry back GT Dave! It’s a living culture of mico-organisms that’s fermented in order to produce a bevy of goodness for your body to restore a natural balance. Some of the goodies include amino acids, enzymes, probiotics, polyphenols, and antioxidants. Bottom line: good for the tummy, immune system, and skin! It’s a raw food. It hasn’t been heated or pasteurized, so it retains all of its nutrients. It’s organic! No icky preservatives or sprays on anything added to the bottle. In fact, the presence of the antioxidants in the body that comes from drinking Kombucha can help eliminate free-radicals that are present in the body (from pesticides and preservatives in the typical Western diet). It’s a glass bottle. No BPA leached here. I strongly believe in the benefits of Kombucha, and the ability it has to help our bodies fight off the potential for cancerous growth. When we talk about cancer prevention this is one for the arsenal. If you’re new to Kombucha I recommend starting with the Multi-Green flavor. It’s not as intense as some other flavors, so once you get used to that you can move on to my favorites: Mango, Strawberry, and Gingerberry. Who knows, maybe I’ll be seeing you in ‘buchaholics anonymous. Hello, My name is Annik, and I am a try-it-once-then-never-again Kambuca drinker. I want to like Kambucha but the fizziness of it tells my tongue that it’s “gone off.” Can you tell me how I can trick my tongue and my brain into liking it? I know, I know. It’s not an easy drink to get into. I admit that it took me three or four times to get past the intense taste of vinegar/sauerkraut, and I love both! And to be completely honest, I used to make fun of my brother for drinking it. But somehow after a few tries I started to appreciate how good it made me feel and I also started craving the different flavors. I really think the best one to start with is the Multi-Green, there’s not such a strong taste of vinegar. I say give it a few more tries and see what happens. I really am disappointed. It’s just too bad, but when you can make it at home why bother anymore? I really am a stickler for service, and I gave them more tries than I’ve ever bothered to do before. Oh well, plenty of great places to eat in SF. 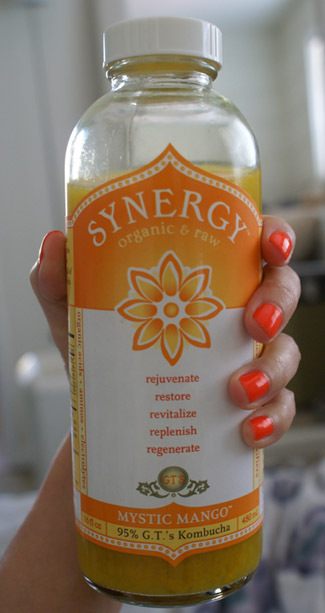 does drinking kombucha turn your nails orange?